Approx. Weight: 1 lbs. 1 oz. Be the FIRST to rate this product! Be the FIRST to review this product! 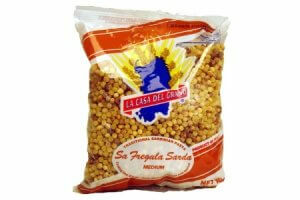 Fregola Sarda is a Sardinian pasta, that has a lot of similarities with couscous or Acini de Pepe. Big difference is that the Fregola Sarda is toasted. It is a pasta made from durum wheat semolina that has been 'rolled' into tiny balls of 2-3 mm in diameter, then they are sifted and divided into small, medium and large. Our Fregola is the medium version. The last stage of the process is the toasting of the tiny balls until they are richly brown in color and until they have an earthy flavor. The texture of this pasta is a little rough, so you will have an additional experience when you eat it. For the preparation of this pasta it needs to be cooked a little like rice, with an excessive amount of water that is allowed to evaporate during the cooking process. An ideal pasta for soups and salads, in seafood sauces, as a side dish, or as a complete meal. We accept payment by American Express, Master Card, Visa, Discover and PayPal! Featuring FedEx Express Courier delivery to your doorstep! Comments, questions or problems with our Website?